Brisbane Jazz Band 254 are an established pair of musicians who have collectively performed alongside James Morrison, Ian Moss, Rhonda Burchmore, Wendy Matthews, Venetta Fields, Julie Anthony and Carl Risely to name a few. Their experience has allowed them to perform both nationally (Sydney, Melbourne, throughout Queensland) and internationally (Japan, USA, Malaysia, East Timor). They have performed at hundreds of weddings and corporate events throughout South East Queensland and have an extensive range of jazz, easy listening and classic pop music. 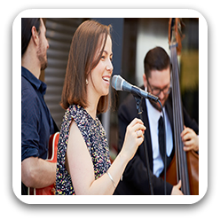 Whether you want ambient dinner music, some up tempo classics such as Stevie Wonder, or a mixture of both, Brisbane Jazz Band 254 are guaranteed to deliver a professional and polished performance to complement your specific function. Both main members graduated from the Queensland Conservatorium of Music in 2012/2000. From ballads, to blues, to swinging tunes, to old time classics, Brisbane Jazz Band 254 will be sure to illuminate your night! Can perform as a: Duo, 3 and 4 Piece Band and are available to perform in Brisbane, Gold Coast, Sunshine Coast and Surrounding Areas. Performed at my daughter’s wedding and really enhanced the occasion. Beautiful vocals and excellent backing. Really nice people and appreciated by all our guests. Highly recommended. Thanks very much for contributing to the success and enjoyment of our reception. “Funny Valentine” is and will be a favourite forever as our first dance.